The train arrived at Buffalo at 5 o’clock P.M. The crowd at the depot was something unprecedented in the history of popular gatherings in this part of the country. It is estimated that at least seventy-five thousand persons must have participated in the turbulent ceremonials which greeted the arrival of the President elect. The military arrangements, organized with reference to previous gatherings of the sort, were found to be utterly inadequate. As the train rumbled into the great depot — a structure capable of containing at least ten thousand people, the single company on duty, together with a few struggling policeman, were swept away like weeds before an angry current. The crush was terrific. Thousands and thousands of men without, urging, pushing, and struggling, endeavored to force an entrance to the depot, which was already packed to its utmost capacity. The President himself narrowly escaped unpleasant personal contact with the crowd. An intrepid body-guard, composed partly of soldiers and partly of members of his suite, succeeded, however, in protecting him from maceration, but only at the expense of incurring themselves a pressure to which the hug of Barnum’s grizzly bear would have been a tender and fraternal embrace…. 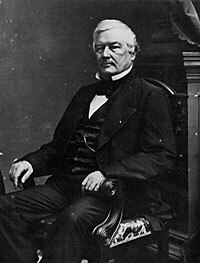 The President was received by his predecessor, Mr. Fillmore, who uttered the briefest possible words of welcome to the distinguished guest, after which they entered carriages and proceeded in the direction of the American Hotel. The streets were densely thronged, the cheers unremitting, the stars and stripes waved everywhere, from roofs, from windows, from balconies, festoons of drapery, banners with inscriptions of welcome, in fact all the traditionary accessories of popular demonstration were copiously distributed throughout the entire route. I am unwilling, on any occasion, that I should be so meanly thought of, as to have it supposed for a moment that I regard these demonstrations as tendered to me personally. They should be tendered to no individual man. They are tendered to the country, to the institutions of the country, and to the perpetuity of the [liberties of the] country for which these institutions were made and created. Your worthy Mayor has thought fit to express the hope that I may be able to relieve the country from its present–or I should say, its threatened difficulties. I am sure I bring a heart true to the work. (Tremendous applause.) For the ability to perform it, I must trust in that Supreme Being who has never forsaken this favored land, through the instrumentality of this great and intelligent people. Without that assistance I shall surely fail. With it I cannot fail. When we speak of threatened difficulties to the country, it is natural that there should be expected from me something with regard to particular measures. Upon more mature reflection, however, others will agree with me that when it is considered these difficulties are without precedent, and have never been acted upon by any individual situated as I am, it is most proper I should wait, see the developments, and get all the light I can, so that when I do speak authoritatively I may be as near right as possible. (Cheers.) When I shall speak authoritatively, I hope to say nothing inconsistent with the Constitution, the Union, the rights of all the States, of each State, and of each section of the country, and not to disappoint the reasonable expectations of those who have confided to me their votes. The next day was Sunday, February 17. The New York Herald’s Villard reported: “Mr. Fillmore called at ten A.M. with a carriage for Mr. Lincoln and both attended divine service at the Unitarian church. Dr. Hosmer, the pastor, invoked the blessings of heaven upon the incoming Administration in a most impressive manner, in his opening prayer. All of the congregation were moved to tears. From the church the ex-President and the President-elect rode back to the hotel and were joined by Mrs. Lincoln when the party was driven to Mr. Fillmore’s private residence to partake of a lunch.”12 That evening, President-elect Lincoln was taken by acting Mayor Beemis and former President Fillmore to a meeting at St. James Hall at which Father John Beeson explained his experiences among American Indians and the mistreatment of them which he had witnessed. Victor Searcher, Lincoln’s Journey to Greatness, p. 120. Harry E. Pratt, Concerning Mr. Lincoln, p. 63 (Letter to Adoniram J. Blakely to Dan Blakely. February 16, 1861). Henry Villard, Lincoln on the Eve of ‘61, p. 88-89. Victor Searcher, Lincoln’s Journey to Greatness, p. 121 (Buffalo Express, February 1861). Michael Burlingame, editor, Lincoln’s Journalist: John Hay’s Anonymous Writings for the Press,1860-1864, p. 33-34 (February 18, 1861). Roy P. Basler, editor, The Collected Works of Abraham Lincoln, Volume IV, p. 220-221 (February 16, 1861). Michael Burlingame, editor, Lincoln’s Journalist: John Hay’s Anonymous Writings for the Press,1860-1864, p. 34-35 (February 18, 1861). Victor Searcher, Lincoln’s Journey to Greatness, p. 126. Michael Burlingame, editor, Lincoln’s Journalist: John Hay’s Anonymous Writings for the Press,1860-1864, p. 33. Michael Burlingame, editor, With Lincoln in the White House: Letters, Memoranda, and Other Writings of John G. Nicolay, 1860-1865, p. 28 (February 17, 1861). Henry Villard, Lincoln on the Eve of ‘61, p. 90.